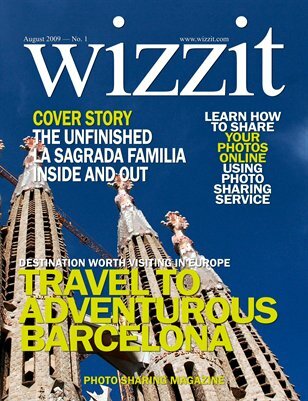 Wizzit Magazine makes a virtual tour to Barcelona and introduces one of the most interesting sightseeing in Catalonia. The magnificent cathedral La Sagrada Família is still under construction after more than 100 years of building. The official starting day of the temple was on 19th March in 1882. World famous Catalonia architect Antoni Gaudí began building this extraordinary temple in 1883 after the resignation of Francisco del Villar, architect who originally started building the temple. Gaudí could never finish his masterpiece although he spent more than 40 years building this huge monumental cathedral. Unfortunately Gaudí was knocked down by a tram and he died three days later aged 74 in July 1926. Today millions of tourists all over the world visit the construction site admiring the stunning craftsmanship nevertheless the cathedral is still incomplete. Take a virtual photo tour into this outstanding temple with Wizzit Magazine.